As the terrorist threat in the UK is expected to remain high for the next two years, British interior minister Sajid Javid is getting ready to announce a revised counter-terrorism strategy. According to Javid, the new counter-terrorism strategy, known as Contest, has incorporated lessons from the London and Manchester attacks, which claimed 36 lives, last year, as well as approaches and responses to them. In a significant shift, the new strategy is expected to suggest increased information-sharing between security services and the private sector, for instance, MI5 will be alerted to suspicious purchases more quickly, which will see intelligence agencies cooperating more closely with businesses to eradicate “safe spaces,” largely used by extremists. “That includes faster alerts for suspicious purchases, improving security at crowded places across the UK, and reducing the vulnerability of our critical infrastructure. […] Ultimately our approach is about ensuring there are no safe spaces for terrorists. No safe spaces internationally, in the UK, or online,” Javid said. Speaking with the BBC on Sunday, Javid said the information-sharing part was devised to ensure there is a “much higher chance” of detecting and disrupting terrorist plots at an early stage. Javid revealed that the government sought to recruit 2,000 extra officers into the security services to counter the “severe terror threat,” and also reiterated his commitment to increasing funding for police in the next expenditure review. The interior minister’s proposals under the new strategy will also include increasing maximum sentences for certain offenses, such as repeatedly viewing terror content online; enhancing the use of data to track terror suspects and laying out a new approach to tackle right-wing extremism. ”We need to offer compelling alternatives to the narrative of hate. It doesn’t matter whether it’s Islamist extremists, with their claims that our shared values are incompatible with the religion of Islam. Or the hateful extremists of the far-right, who feed off the narratives of Islamists to attack our multi-ethnic society. These people want to destroy the values we hold dear, and undermine the freedoms that make us who we are,” Javid said. Since 2017 the UK police say they have foiled 12 terrorist plots, and are currently handling over 500 live operations, involving some 3,000 “subjects of interest” at any one time. 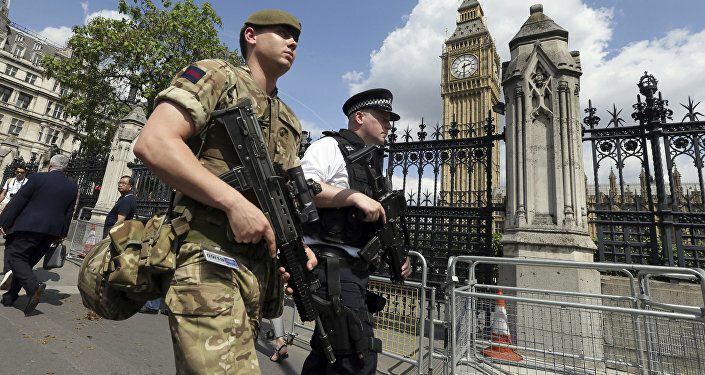 Last year, the UK faced a series of terror attacks, including the March 2017 assault on Westminster Bridge and on the Parliament grounds in London, as well as the May 2017 attack during a concert in Manchester, which killed at least 22 people and injured 120 others.